By Tefta Cami – Member of the CC of the PLA and Minister of Education and Culture of the PSRA. Among the successes achieved over these 35 years, the changes carried out in the field of ideology and culture, which are a real revolution, occupy a special place. The deepening of the ideological and cultural revolution today is the major task of the program of the party for the complete construction of the socialist society; it is also one of the most important conditions for the further revolutionization of the whole lifeof the country in struggle against any influence of the reactionary bourgeois and revisionist ideology and culture. The triumph of the people’s revolution and the establishment of the dictatorship of the proletariat mark the complete overthrow of the old society and the beginning of the transition on to a new higher society in every aspect: economic, political, ideological and cultural. The construction of socialist society is a long and complex process which develops according to a series of general objective laws, among which the laws of the ideological and cultural revolution, too. The radical changes in the field of ideology and culture, the creation and ceaseless enrichment of the socialist ideology and culture, their mastery by the broad working masses are indispensable conditions for the consolidation of the dictatorship of the proletariat and the extension of socialist democracy, the all-round development of the forces of production and the setting up and improvement of the socialist relations of production, the further strengthening of the defence potential of the socialist Homeland. The Party has considered and solved the problems of the ideological and cultural development in their dialectical unity with those of the economic and political development. This dialectical interaction of the ideology, economy and politics has underlied the basis of the general line of the Party for the construction of socialism in all the stages of its struggle for the ceaseless development of the socialist revolution. The aim of the ideological revolution, its fundamental task, is to implant the proletarian socialist ideology deep in the consciousness of all the working people and to eradicate the old reactionary ideologies, to educate and temper the new man with the materialist and dialectical world outlook, with the virtues of communist morality, to enable him to destroy the old world of oppression and exploitation and to build the new socialist and communist society. The ideological revolution is not a spontaneous process. It is led, organized and guided in a conscious manner by the Marxist-Leninist party, it is the party which gives the ideological revolution its content, which creates the political and ideological conditions for its triumph. This is the first and the most significant truth which emerges from the entire development of the ideological revolution in Albania, its successes and achievements. One may engage in demagogical talk of Marxism-Leninism and socialism, but if the party degenerates, if it changes colour, as was the case in the revisionist countries, there can be no talk of the ideological revolution, the triumph of socialism and communism in the consciousness of the working masses. Just like in any other field of the socialist construction, in the ideological revolution, too, our Party has defined a correct, clear-cut and consistent Marxist-Leninist policy, it has skilfully combined loyalty to the general principles of Marxism-Leninism and their creative implementation in the concrete historical conditions of our country. In the carrying out and uninterrupted development of the ideological revolution, the Party has based itself on the ideological patrimony of Marx, Engels, Lenin and Stalin, which has been defended and further enriched by our Party and Comrade Enver Hoxha. The ideological revolution, just like the socialist revolution in our country, has always proceeded on the correct road of growth and development, because our Party has been vigilant and acted with a firm hand in waging a stern class struggle, it has discovered the opportunist, liberal and sectarian deviations in the embryo, has hit them hard just as they have emerged, without permitting them to grow worse and become a hostile line or to get control of the Party, as happened in the Soviet Union and other revisionist countries. The road of the gigantic struggle for the carrying out of the many tasks of socialist construction, which frequently were complex tasks that emerged for the first time, the irreconcilable struggle against the innumerable internal and external enemies, was illuminated step by step by the comprehensive theoretical work of the leader of our Party and people, Comrade Enver Hoxha, which is a brilliant support for and development of Marxism-Leninism of our days. For the ideological education of our people today and in the future we have at our disposal such broad theoretical creations as the Works of Comrade Enver Hoxha, “Imperialism and the Revolution”, “Reflections on China”, “Yugoslav ‘Self-Administration’ – a Capitalist Theory and Practice”, the echo of which has gone beyond the borders of our country and have become property of the world Marxist-Leninist revolutionary thought. The practical implementation of the Marxist-Leninist teachings of the Party and the ideas of Comrade Enver Hoxha has been and remains a decisive condition for the further deepening of the ideological revolution in our country. In the struggle for the carrying out of the ideological revolution the Party bore in mind that the people with whom it was to carry out this revolution boasted rich patriotic and revolutionary traditions, especially of the National Liberation war and the people’s revolution, they had taken an active part in the work of socialist construction, and have had great faith in the word and deed of the Party. This was and is a powerful basis for the education and re-education of the masses with the ideas of Marxism-Leninism. At the same time, the Party had to overcome all the difficulties deriving from all kinds of influence of patriarchal and feudal, bourgeois and petty-bourgeois ideologies which have been rooted in the conditions of the centuries-old existence of private ownership as well as the pressures and influences of the bourgeois-revisionist ideology that manifested themselves in the old school and culture, in the social psychology, backward customs, the stand towards the woman, family relations, religious beliefs. In these circumstances, the ideological revolution was carried outfrontally; it extended in all directions, in education, literature and arts, in science and all the other aspects of social consciousness; entered all the activity of the working people, society and right down to every cell of society, inculcating the dialectical-materialist world out-look, the communist morality, the revolutionary concepts on the work, life and society in everybody. The ideological education and re-education of the working people has not been regarded by the Party merely as a process of enlightenment, but as one which is carried out through stern class struggle, where two diametrically opposed ideologies clash for life or death. It expresses the opposed interests of antagonistic classes. Therefore, a stern class struggle has been and is being waged on this front not only because the old ideologies have age-old roots and are hard to put down, but because the remnants of the overthrown reactionary classes hope to realize the counter-revolutionary degeneration of socialism and the restoration of capitalism through their ideology. The Party has always waged the class struggle on the ideological front with the same intensity as on the other fronts, drawing and hurling the broad masses into revolutionary actions for the constructionof socialism and the defence of the Homeland, against the internal and external enemy,against ideological aggression and the pressure of the bourgeois-revisionist encirclement, which are closely linked with each other, provide nourishment for and back up each other. The Party has not restricted the ideological education in the field of theory alone, has not regarded it as a cut-and-dry process, but has organized it in such a manner that the youth, the working masses, equipped with the ideas and teachings of Marxism-Leninism, take an active part in it by throwing themselves into revolutionary actions, in the daily class struggle through which socialism is built, and there, in the course of revolutionary work and initiatives of the working people, the mettle and strength of the ideological conviction is tested and all the alien remnants and manifestations, which do not reconcile themselves with them, are combated, A main principle in the ideological revolution has been and remains the fact that the working people must learn and be educated by the book and work, at school and in life, in theory and practice. In the revolutionary education and re-education of the working people, in carrying out the ideological revolution, the Party has always acted from positions of attack, guided by the Leninist principle that, in the present spiritual life, there is the alternative: either the socialist ideology or the bourgeois ideology, because there these two cannot be reconciled, nor can there be a neutral line, a third line. The Party has stuck by this Leninist principle not only on the internal front but also on the external front of this struggle. The Party has always carried out the ideological revolution in irreconcilable struggle against all the trends of modern-revisionism – Titoite, Soviet, Chinese and “Eurocommunist”. The great polemics which our Party has engaged in with modern revisionism of all hues has played an important role in the revolutionary education and re-education of the working people, and at the same time has made an outstanding contribution to the defence and development of triumphant Marxism-Leninism. The revolutionary education and re-education of the working masses, the ideological struggle against bourgeois-revisionist, old and new, remnants and influences, accounts for and is a decisive factor of the great successes achieved in all the fields of socialist construction: in the political field, for the protection, strengthening and perfecting of the dictatorship of the proletariat and socialist democracy; in the economic field, for the creation, strengthening and perfecting of the socialist relations of production and for the complete construction of the technical-material base of socialism; in the cultural field, for the creation, flourishing and defence of our socialist national culture; in the military field, for the increase and strengthening of the defence potential of our socialist Homeland. The ideological revolution advances non-stop. The profound socialist transformations that have taken place in the different fields of social life, especially in the construction of the economic base of socialism in town and countryside, and the liquidation of the exploitation of man by man in our country, created ever more favourable conditions for the deepening of the ideological revolution, hit harder at the patriarchal, feudal and bourgeois old ideologies and inculcated the proletarian socialist ideology more deeply into the consciousness of the working people. With this victory, the ideological revolution in Albania entered a new higher stage of its development, one which found its expression in a series of revolutionary actions of an ideological character, such as the struggle for the implementation of the revolutionary principles and norms of the Party and the political, ideological struggle against bureaucracy, the movement to place everywhere the general interest above personal interest, the movement against religion, religious prejudices and backward customs, the movement for the complete liberation of the woman, the movement for the revolutionization of the school, etc. At the roots of this movement was the struggle to purge society of everything old, patriarchal and conservatory, liberal and bureaucratic, to affirm the progressive new everywhere, in all the fields of life, to strengthen and steel the moral-political unity of the people, the dictatorship of the proletariat, to revolutionize the superstructure, to bar the ways to bourgeois-revisionist degeneration. But the ideological revolution which has the task of making the socialist ideology not only a dominating ideology, but also the only ideology of all society, all the working people, is not a matter of a period of some decades. Therefore, the struggle to constantly deepen the ideological revolution until its complete triumph, remains one of the most important targets of the general line of the Party, one of the greatest tasks of the life and work of the working class, the cooperativist peasantry, the people’s intelligentsia. Without guaranteeing the complete victory of the socialist revolution in the field of ideology, the victories of the socialist revolution in the field of economy and policy cannot be ensured. This has been brilliantly proved by the experience of our country, where socialism is flourishing in all fields. The negative experience of the Soviet Union and the other former socialist countries where the dictatorship of the proletariat has been liquidated, where the economic base of socialism has been destroyed, where capitalism with all its contradictions and ills has been restored proves the same. The ideological degeneration of the Communist Party of the Soviet Union has been one of the factors which prepared and created the conditions and premises for the economic and political degeneration. Deviation from Marxism-Leninism, renunciation of the great ideological patrimony of Lenin and Stalin, the transition to the positions of the bourgeois and reactionary ideology are at the roots of the counter-revolutionary changes that have taken place in the Soviet Union, of all those grave economic, political, moral and spiritual crises which characterize Soviet society today, a typical bourgeois imperialist society. In the question of the ideological revolution, as in all the other questions of principle, our Party has never reconciled itself to the Chinese revisionists and their ideas, or the so-called “Mao Tsetung thought”. It is now known world wide – and this has been excellently backed with facts by Comrade Enver Hoxha in his Works, “Imperialism and the Revolution” and “Reflections on China” – that the revolution in China failed that it was not transformed and did not grow into a socialist revolution. Not only the genuine socialist revolution in the field of ideology was not carried out, but it was never begun in China. What is more, in the sixties, when the Chinese revisionists raised all that unprecedented confusion, allegedly to carry out “the great proletarian cultural revolution”, nothing in common with the genuine Marxist-Leninist ideological and the cultural revolution was realized. It was just a struggle of various factions about who would prevail over the other and seize power. This is proved best by the present situation in China, where all the doors have been opened wide to the bourgeois and revisionist ideology, decadent art and religious opium, where the feelings of nationalism and chauvinism, racism and militarism are widespread. The ideological revolution, the socialist transformation of the consciousness and ideas of the working people cannot be achieved without the development of education, art, science, culture in quality and quantity, without a whole cultural revolution. Apart from this, education, science technique, culture are a very important factor of material and economic progress, a necessary condition for the development of the forces of production in socialist society. Without qualified working people, equipped with broad culture, we could not have an increase of work productivity, neither a strengthened and advanced socialist economy. The Party has considered the development of culture in two main directions, an important factor of the technical-scientific revolution, as well as an important factor for the realization of its program of the development of the forces of production and the spiritual life of society. The new conception of the culture, its role and place in socialist society and in the life of every worker gives a new orientation to the cultural development in new paths, unknown to the bourgeois revisionist societies, on to the path of the complete democratization and its all-round revolutionization. Our cultural revolution has decisively been led by Lenin’s instruction that culture belongs to the people and should be given to the people, that it should encourage and enliven the talents oppressed and lying latent under the exploiting order. Therefore, right from the beginning the Party passed over to the stage of giving education and culture gratis, and from a privilege of a minority made them a treasure of the masses. Carrying out the orientations of the Party for the cultural revolutionization of the country, the uneven cultural development, as one of the sore wounds of our old society, was done away with, and the long-centuries dream of the people to get education and culture, to live a cultured life, has become a reality. The carrying out of the cultural revolution was connected with a series of difficulties and obstacles. First, a radical and critical re-examination of the whole of the old culture had to be made, and on this basis the new culture would be set up to serve the emancipation of the working people, the outburst of their creative energies and talents, the creation of the new, classless society. Second, during the cultural revolution we had to overcome the great cultural backwardness which the reactionary regimes had imposed on our people in the past. Third, the cultural revolution would be carried out in a poor country, neglected by the feudo-bourgeois ruling classes and the foreign occupiers and, moreover, devastated in the course of many-years’ struggle against the foreign enemies and the local traitors, it was to be made through the difficulties raised by the imperialist-revisionist encirclement. During these recent 35 years, the rapid rates have been the fundamental characteristic of the cultural development of our country. Regardless of the great backwardness of the country, the Party decided to build new socialist society without oppression and exploitation within the shortest time possible. Therefore, things should not be left to mark time or be left to time to solve them. In the field of education, to mention only this, illiteracy among people aged 40 year old was liquidated inside of 10 years, something unprecedented in the history of any country; obligatory elementary schooling free of charge became a reality in 5 years, the higher schools were set up in 6-7 years, whereas the University in 12 years. In the process of their qualitative and quantitative development, education and culture became widespread in all fields and sectors, in town and countryside. The extension of the network of the educational and cultural institutions, the increase of their numbers was accompanied with the struggle for qualitative improvement of work in them, the strengthening of the educative content of school, the training of the qualified cadres. The flourishing of our new culture was made through great sacrifices and expenditure. But they justified themselves completely; our new school, art, socialist culture have made a great contribution to and became a powerful support for all the struggle and work of the Party and people for the building of socialism, the raising of the wellbeing of the masses. In the process of the creation of our new culture, and the development of the cultural revolution, first of all, the Party gave a correct solution to these problems of vital importance for our culture and its future: the ideological content of culture, the relationships between new culture and the national people’s culture of the past, and the progressive culture of the other peoples and countries. As to the ideological content of culture, the Party has proceeded from the Marxist thesis that no culture can exist outside ideology, outside classes, that all cultures are inspired by given ideologies and serve the interests of given classes. Hence, the new socialist culture should draw inspiration from the proletarian ideology and should completely serve socialism. Right from the beginning, the aim of the Party has been that education, science, art, and culture should be based on the Marxist-Leninist ideology, that all people engaged in cultural activities: teachers, artists, writers, journalists, should be guided and inspired by Marxism-Leninism in all their creative work. The collaboration of the socialist ideology with culture, education and art, the interrelation between them, have been and still remain an important condition for the existence of culture and impart to it an always militant content, which carries it forward in all directions, and enables it to carry out its role of aid of the Party in the ideological education and the mobilization of the people for the building of socialism and the all-round progress of the country. The Party has rejected and fought all liberal views in the field of culture. It has never reconciled itself with the anti-popular and anti-revolutionary, liberal and opportunist views of Sejfulla Malëshova, Tuk Jakova and the other revisionists. It has exposed their attempts to negate the role of the Marxist-Leninist ideology and the content of the socialist culture, their efforts to equalize it with the western bourgeois culture. The other enemies of the Party such as Fadil Paçrami and Todi Lubonja, who strove to become the spokesmen of the decadent bourgeois-revisionist art and culture in our country, placed themselves in liberal, opportunist and liquidatory positions. The Party discovered in their embryo, combated their decadent concepts and creations in literature, music, painting, in the mode of life, as soon as they manifested themselves. It waged a fierce ideological and class struggle for purging the alien bourgeois-revisionist views in order to ensure that what happened in the revisionist countries never occurs with us. The Soviet Union and the other revisionist countries provide a negative example showing where the revisionist ideology and the anti-Marxist opportunist policy can lead culture, art and education. In China, too, the “Mao Tsetung thought” and the policy of “letting a hundred flowers blossom and a hundred schools contend” have done nothing other but have brought about utter confusion and degeneration in the field of culture, have opened all roads to the decadent bourgeois culture and the degenerated mode of life to penetrate unimpeded and to spread in unprecedented proportions there. As to the relationship between the new socialist culture and the people’s national culture created by the people in the past and carried by them, our Party loyally adheres to the principles and orientations laid down by the classics of Marxism-Leninism on the further development of all the progressive values and traditions of the people. With the appropriation of the positive values of the national people’s culture in a critical manner, the new socialist culture develops and becomes richer, the national character and popular spirit is strengthened, it is easily grasped by the broad working masses, its educative power increases. The stand towards the national people’s culture, in the conditions of the savage bourgeois-revisionist ideological aggression, assumes an important political character and significance. Negation of the national culture and the traditions of the oppressed and small peoples, accompanied with cosmopolitanism, as the other side of the medal, have been the favourite weapons of the ideological arsenal of the imperialists, chauvinists, occupiers. It is not fortuitous that an inseparable part of the aggressive and hegemonistic policy of American imperialism and Soviet social-imperialism is the so-called policy of the “free circulation” of ideas, culture, people, and the policy of suppression of the national culture of the peoples under the weight of the bourgeois-revisionist decadent culture developed by the big powers. It is not fortuitous either that the Soviet revisionists spurn the legitimate aspiration of the peoples of the Soviet Union to preserve and develop their national culture, while they try to impose the Russian language on the Soviet nations and nationalities against their will. In the revisionist Yugoslavia, too, the economic and political discrimination of the oppressed nations and nationalities finds its expression in cultural discrimination, in the many obstacles they raise to the affirmation of national languages and traditions. Generation after generation, century after century, our people created, collected a rich material and spiritual culture with a stable and democratic character which they defended from the foreign invasions and in which they expressed their loftiest moral and political virtues, such as bravery, loyalty to friends, justice and irreconcilability to the enemies and the unjust, optimism and national pride. This treasury consists of their beautiful rich songs, dances and costumes, their magnificent folklore, the many cultural monuments, and others. The work, tools, buildings and the positive traditions of the way of life are also included in it. It consists of the works of our artists, writers and thinkers, among which those created during the brilliant period of the National Renaissance of Albania as an outstanding political and cultural manifestation. Comrade Enver Hoxha has always given orientations that our new socialist culture should preserve and further enrich this patrimony of the national culture and its patriotic and revolutionary, laic and democratic traditions, created and handed down from generation to generation in the difficult conditions of the past. History and philosophy, archaeology and ethnography, linguistics and the Albanian folklore, the whole of the cultural front, inspired and guided by this orientation, have brought to light many values which had been discarded or hidden by time or have been presented in a distorted light by the foreign chauvinists, ideologists and scholars of the reactionary feudo-bourgeois classes, and have turned it into the property of the new socialist culture. Thus, the history of the Albanian people has been written beginning from scratch, on scientific bases and in the light of the materialist understanding of history and the national interests; the ancient origin, great wealth and power of expression and beauty of the Albanian language have been studied and put into relief. Artistic values of songs, dances, folk costumes have been brought to light, the great popular uprisings in the course of centuries have been re-appraised, prominent national personalities of the pen and rifle whose name and contribution have often transcended the borders of the homeland and have gone down in the treasury of world culture, have been made known. Respect for the valuable contribution of a people to culture does not exclude, on the contrary it implies respect also for the treasury of world culture, for the progressive cultural values of other peoples. In the field of culture, too, our Party combines patriotism (defence of our people’s traditions and culture) with internationalism (evaluation of the progressive culture created by other peoples). The Party and Comrade Enver Hoxha have emphasized the necessity to take from world culture everything progressive and valuable, responding to the demands of our country at each stage of its formation and development. “Progressive culture and science have universal importance”, Comrade Enver Hoxha writes, “and we as communists, basing ourselves on our Marxist-Leninist science, which is universal, do not reject the progressive world culture and science of different peoples and countries.” (5) Making use of the treasury of the progressive culture of mankind, our Party has instructed our people to take an irreconcilable and critical stand towards everything reactionary, decadent, cosmopolitan and chauvinistic which the imperialist bourgeoisie and revisionism try to smuggle into the present-day world culture. Following the example of the great Lenin, our Party and Comrade Enver Hoxha have been engaged in a consistent struggle against the Soviet revisionists who, allegedly under the slogan of the “internationalization of culture” ignore the national cultures of the peoples and export their reactionary and decadent culture. At the same time our Party and Comrade Enver Hoxha have waged and are waging an irreconcilable struggle against Chinese revisionism and “Mao Tsetung thought” which in the field of culture extols the negative aspects of the ancient Chinese culture, Confucius and other idealist ideologies, while assuming a disdainful xenophobic and chauvinist attitude towards world progressive culture and the culture of other people. Uninterrupted Revolutionization of Education, Culture and Science Is an Inseparable Part of the Struggle for the Complete Construction of Socialism. Education, culture, and science have developed parallel with the other sectors of the economy of the country and played an active role for educating, and forming our new man, for his all-round political, scientific, cultural and educational uplift, for the development of socialist revolution in our country. A genuine revolution, both in breadth and depth, has been carried out in the field of our popular education. Our new, socialist school with a national character was set up, and right from the outset it proceeded from democratic and socialist principles regarding education and culture for all, free of charge, and secular for both sexes, and in the mother tongue. Today all our country has been turned into a vast school where one out of three persons attends school regularly. Whereas before Liberation the system of pre-school education almost did not exist at all, now there are 2,545 kindergartens with 86,244 children. While before Liberation less than one third of all the children of the school-age could attend primary school, it is many years since the 8-year education has been made compulsory for all; 78.8 per cent of the students finishing 8-year school attend middle school. In 1938 only 224 students graduated, whereas today just as many and a half more students graduate only from the mechanical branch of the “7 Nëntori” polytechnical school every year. We train cadres and specialists in 48 professions. What distinguishes our education is not only its qualitative growth but, in the first place, its qualitative improvement, the setting up of our new school which, as was pointed out at the 7th Congress of the Party “is ever more consolidating as a socialist school with original characteristics and a popular character”. Our new school is radically different from the old school of the bourgeois- revisionist society both as regards its objective and character and its content, structure and methods of teaching and education. The system of teaching and education in our school is guided by the materialist dialectical philosophy, and is carried out around the Marxist-Leninist ideological axis. By harmoniously combining the three fundamental components: teaching, production work and military and physical training, our school has created the conditions and possibilities for the new generation to learn, be educated and tempered in the practice of socialist construction and take an active part in it. Our school trains working people and cadres loyal to the great cause of the Party and the revolution. It implements socialist democracy, in which there are correct teacher-pupil and school-family relations. The whole socialist society takes a keen interest in the problems of education. While, in all its work and organization, the bourgeois-revisionist school further consolidates and deepens class division between the people of mental and physical labour, training and forming people to serve the bourgeois class in power, our new school, guided by and based on its socialist principles, helps more and more narrow down distinctions between people engaged in mental labour and those engaged in physical labour, it trains and forms people who, with their work and abilities, serve the working class, the working people and, together with them, work for the construction and prosperity of our new society without oppression and exploitation. An important stage in the strengthening and development of our new school started with the historic speech delivered by Comrade Enver Hoxha on March 7, 1968, commenting the conclusions and tasks set by the 8th Plenum of the Central Committee. These documents make up the all-round ideological, political, theoretical, scientific, pedagogical and organizational platform for the further revolutionization of our school. This progress is an outstanding and original Marxist-Leninist contribution of the Party and Comrade Enver Hoxha to education and science, a creative stand in struggle for the defence, implementation and enrichment of the teachings of the classics of Marxism-Leninism on these questions. In the process of realizing this new platform, which revolutionized our whole educational system, our school got free from influences of the old pedagogy and bourgeois revisionist concepts. In its progress, our school also foiled the attempts of enemies who tried to hinder the revolutionization of the school. The implementation of the program of the Party raised our school to a qualitatively higher level, linked it more closely with the needs of the construction of socialism, further increased its active social role. New and greater tasks are facing our school today. It must further perfect its work, so as to respond better to the demands the present stage of development and that of the future development of the socialist revolution put forward. Now we have clearly defined the ways how to realize this great task. Therefore, our school must achieve an even deeper mastery of the teachings of Marxism-Leninism, the documents of the Party and the Works of Comrade Enver Hoxha, in order to raise a new generation of valiant fighters, loyal to the Party, tempered and resolute, industrious and modest, in order to educate them with the feelings of boundless love for the Party and the dictatorship of the proletariat, with the patriotic and revolutionary traditions of our people as well as in the spirit of proletarian internationalism. Of special importance is the question of the ceaseless raising of the level and quality of work of the school, of the efficiency of its three components, so that the pupils and students master advanced science, technique and technology, take an increasing part in working out problems of production and of the technical-scientific revolution, train themselves to be sound physically and well prepared militarily to defend and carry forward the victories of socialism in our country. In the future, in the process of the deepening of the revolutionization of the school, the further extension of people’s education, especially of preschool and secondary education – part time and full time, will continue, so that all workers finish secondary school; likewise, the number of students attending higher schools will increase, and other branches and specialities will be created in keeping with the present and future needs of our economy and culture. The creation of a large people’s intelligentsia, emerged from the ranks of the workers and peasants, loyal to the end to the cause of the revolution and socialism, has been a task of the development of the people’s education and at the same time, a direct result of it. In this question, too, the Party has adhered to the teachings of Marxism-Leninism. It has criticized and exposed the Trotskyite stands maintained by the agents of the Yugoslav revisionists Koçi Xoxe and Pandi Kristo towards the intelligentsia. Likewise, it has criticized the Trotskyite and nihilist stands towards the intelligentsia which were clearly manifested especially in the activity of the revisionist Communist Party of China during the years of the so-called “great proletarian cultural revolution”. At the same time, our Party has not reconciled and does not reconcile itself to the stands of the revisionists who overrate the role of the intelligentsia, who have turned it into a privileged stratum, which, together with the new revisionist bourgeoisie, brutally exploits the working class and the broad working masses. We inherited a very small number of cadres and specialists from the past. The Party followed a wise and principled policy towards them. It bore in mind the patriotic and democratic stand of the overwhelming majority of the old intelligentsia, and especially during the Anti-Fascist National Liberation War and in the course of the work, it worked for its education and re-education. The construction of socialism put forward the task of the creation of the new intelligentsia, the gradual and harmonious training of various and many specialists in accordance with the needs of the development of the economy and culture. The Party solved this difficult task in a revolutionary way, using the most varied forms, from qualification courses to higher studies. On this course, the stratum of the people’s intelligentsia was created almost from nothing, with a completely new social-class and professional structure. Ours is a new socialist intelligentsia, different from the bourgeois-revisionist intelligentsia in its world-outlook and way of living, in its close links with the working class and the working masses, in its moral physiognomy, in its boundless loyalty to the cause of the revolution and socialism, in its revolutionary spirit. In the process of the revolution and socialist construction of the country a new literature and art was born and developed, imbued with the revolutionary ideals of the working class, and militating for the cause of the people and the revolution. The Party has always taken care for our literature and arts to develop in ideological purity, relying on the method of socialist realism and its principles, proletarian partisanship, the national character and the people’s spirit, and for its revolutionization along with the entire development of the life in our country. Guided by these principles, our literature and arts of socialist realism have constantly prospered, have strengthened their proletarian class tendentiousness and raised their ideo-artistic level. The flourishing of our literature and arts covers all genres – prose and poetry, cinematography and music, ballet and fine arts, the theatre and variety show. They have created outstanding artistic values which truly reflect the key moments of the history of our people, of the revolution and socialist construction, of the struggle against imperialism and modern revisionism, militating for the revolutionary education of the masses and reflecting their spiritual life. Our literature and arts of socialist realism enjoy great authority in present-day world literature. They have won this authority thanks to their outstanding ideo-artistic values which combat the decadent bourgeois-revisionist literature and arts, while abiding loyally by the principles of the revolutionary method of socialist realism which allow them to express the lofty- ideals of the liberation of the working masses, of the struggle for the creation of a new society without oppression and exploitation of man by man. With the communist ideas, the national physiognomy, the popular spirit and the high artistic level of their works, our artists and writers will win ever new sympathizers and increase their contribution to the enrichment of the world revolutionary literature and arts. Our literature and arts have been born and developed in irreconcilable struggle with any kind of influence from hostile ideologies. The speech Comrade Enver Hoxha delivered at the 4th Plenum of the CC of the Party on March 15, 1973 and the decisions of this Plenum are of historic importance for the correct Marxist-Leninist development of our literature and arts; for the strengthening of proletarian partisanship, for the consolidation of the popular spirit and national character, for the struggle against alien manifestations of decadent bourgeois and revisionist art and liberal stands towards them. Our writers and artists, inspired by the Marxist-Leninist line of the Party, are strengthening their militant spirit and raising the ideo-artistic level of their creativeness even higher, at a time when they are engaged in dealing in a broader and more profound manner and at a higher artistic level with the magnificent and cardinal theses of our epoch, in order to display in all its splendour and beauty our struggle and our revolution, our outstanding traditions and our brilliant present, the magnificence of our new man, who is always at the centre of these glorious battles. Only in this way will our literature and arts fulfil their lofty and noble mission for the communist education of the working masses. Overcoming the cultural backwardness, in the process of the construction of socialism, we have succeeded in organizing and carrying out a broad activity in the field of mass culture. Beginning almost from scratch, a vast network of cultural institutions has been created today, which possess many means of information and which carry out an all-round cultural activity. Today, newspapers, magazines and books enter into every Albanian family. The cinematography and television, professional theatres and operas and ballet theatres as well as a network of houses and centres of culture, museums and libraries extend all over the country. During the recent years work has been stepped up to strengthen the revolutionary spirit of cultural activities and their ideological effectiveness, efforts have been made for these activities to penetrate all social strata and serve the masses better. The all-round activity of cultural institutions plays a major role in the revolutionary and patriotic ideo-political education of the masses, in raising their professional level, in propagating the new achievements of science and technology and advanced experience, in implanting new socialist concepts on the mode of living, in combating influences of the reactionary bourgeois and revisionist culture. Cultural work has helped narrow down distinctions in the cultural development between town and countryside. Our socialist village leads today a more intensive cultural life; 8-grade and secondary schools, centres and houses of culture, maternity-house and out-patient clinics carry out their activities throughout the countryside which is entirely electrified, enjoys medical service free of charge, while new buildings have been set up for communal services and the new socialist mode of living is being consolidated. The 6th and 7th Congresses of the Party and Comrade Enver Hoxha have instructed us to proceed from a broad concept of culture and the cultured man, combining spiritual culture with material culture and the means of culture should cover all the areas where masses live and work, so as to achieve their ever more harmonious development both in town and countryside, extending their activities in work centres and social institutions and within the family, so that our new man finds a cultured socialist environment in all his social, family and personal life. A significant result of the ideological and cultural revolution and at the same time a condition for its further development is the new science, mass scientific experimentation, the development of the technical-scientific revolution. Science is ever better being mastered by the vanguard cadres, specialists, workers and cooperativists, and the youth, and is becoming a powerful means for carrying out the new tasks put forward by our unceasing development towards the complete socialist society. Comrade Enver Hoxha has highlighted and explained in all-round manner the complicated problems related to the essence, the role and place of the technical-scientific revolution in the conditions of our country. Comrade Enver Hoxha has pointed out that the technical-scientific revolution cannot replace the socialist revolution, cannot solve the contradictions of capitalism and cure its ills. In the conditions of the dictatorship of the proletariat alone, the technical-scientific revolution serves the interests of the masses and becomes a force which promotes the socialist society. By contrast, in the conditions of the bourgeois-revisionist society, it only increases the profits of the capitalists, increases the oppression and exploitation of the working masses, creates other ills and contradictions which can be solved only through the proletarian revolution. A number of institutions have been set up in our country for the development of science such as the Academy of Sciences with its specialized institutions, the University and other higher schools, as well as many institutes and other scientific centres. Nevertheless, the Party does not limit the technical scientific revolution to these institutions and research centres alone, but extends it further, linking it with the work and talent of the broad masses of the people, of those who work on various fronts of production and for the defence of the Homeland, relying on a self-supporting basis. An expression of this correct Marxist-Leninist stand is the instruction of the Party to introduce advanced science and technology into all the fields of social activity, so that the entire development of the country is based on scientific bases, so that scientific studies and research become a method of work and lead it. Especially great tasks face science and scientific experimentation for the development of the technical-material base of industrial production, for finding out new ways for the intensification of agriculture, for the improvement and modernization of the technological processes of production, for the study and summing up of the scientific thought and revolutionary practice of our Party and people, for the all-round study of the history of our country and its culture. A great reserve for the extension and raising of the level of scientific research is the utilization of the new achievements of world science and technical progress according to the principles of Marxism-Leninism, through the procurement and organization of broad scientific information, the qualification and specialization of cadres and specialists in branches and fields which have to do with our perspective development, as well as the mastery of foreign languages by students and specialists as an indispensable means for the mastery of world science, technology and progressive culture. Science and culture are not the monopoly of any country or people, they are not the monopoly of the big powers, as the imperialists and revisionists would like them to be. Lack of confidence in the creative abilities of smaller peoples is a mistaken and reactionary idea which stems from the imperialist ruling circles. In the past, our people have produced outstanding men of science and technology whose names have gone down in the history of world culture and science. This is even more possible in our time, in the time of socialism when the possibilities for the representatives of our people to make a further contribution to science and technology have multiplied. The fundamental task of the ideological and cultural revolution is the moulding and tempering of the new man with the Marxist-Leninist world outlook, with the lofty spirit of patriotism and proletarian internationalism, of socialist collectivity, with the spirit of sacrifice and heroism, with new concepts of work and life, with lofty revolutionary ideals. The ideological class struggle for the formation and tempering of the new man is protracted and difficult, sharp and complicated, it is a struggle on a broad front which is spearheaded against all the forms of the ideology of the exploiting classes, against the bourgeois-revisionist ideological aggression. Precisely this situation dictates the necessity of an ideological class struggle on both flanks – against the decaying old coming from the depths of centuries and against the corrupted and confusing new coming from the present bourgeois-revisionist world; against both the internal hostile pressure and external hostile pressure; against both conservatism and liberalism, because they are closely linked together, back up and provide nourishment for one another. The experience of socialist Albania and the generalizations our Party has made from negative experience of the Soviet Union and the other revisionist countries prove that the ideological struggle against all anti-socialist alien manifestations is a decisive condition to prevent bourgeois degeneration and the restoration of capitalism, one of the most important aspects of the class struggle for the triumph of the socialist road over the capitalist road. This struggle becomes even more imperative in the present conditions of the savage ideological and cultural aggression by the superpowers, of the all-round pressure exercised by the bourgeois-revisionist encirclement. The establishment and ceaseless consolidation of the people’s power – the dictatorship of the proletariat, the liquidation of the exploiting classes and the exploitation of man by man, the creation and consolidation of the socialist property and socialist relations of production, the implementation of the socialist principle of distribution – all these are objective economic-financial factors for the eradication of the old bourgeois and petty- bourgeois mentality, for the prosperity of socialist collectivization, for the formation of the socialist stand towards labour and social property. To these objective factors is added a powerful subjective factor – the organized and conscious work of the Party and all its levers, the action of the unified front of communist education. At the centre of this activity lies systematic work to master Marxism-Leninism, the teachings of the Party and Comrade Enver Hoxha, which is realized both through study and the participation in the class struggle for the construction of socialism, in revolutionary actions, movements and initiatives. Among these movements and initiatives an important place is occupied by those which are aimed to educate our people to proceed from the general interest, to correctly combine personal interest with general interest, to place general interest everywhere above personal interest, as well as to develop their feelings of socialist solidarity. To this end, a series of revolutionizing actions and measures have been taken to avoid undue personal profits to the detriment of general interest, to establishing a correct ratio between material and moral stimuli, to teach people to demand from the society as much as they give it and as much as it belongs to them, thus strengthening the socialist stand towards labour, to teach them to see the source of their wellbeing in socialist social property, in the struggle for its strengthening and prosperity. To always consistently implement these measures means to avoid the bourgeois-revisionist degeneration of our people. Our experience proves that for the socialist revolution to be deepened a continuous consistent struggle against manifestations of bureaucracy as a world-outlook, a method and practice of work, is required. This struggle is of decisive importance to educate all the working people, all the communists and, especially, the cadres and the intelligentsia with the revolutionary spirit. It has found its expression in a number of actions and practical measures of a profound political and ideological significance, such as the establishment of more correct relations between the cadres and the masses through the implementation of active socialist democracy and worker and peasant control, the organization of production work for all the workers of the mental labour; the raising of people from the ranks of the working class to the organs of the Party and state power. These measures have enabled the cadres and intelligentsia to imbue themselves with the revolutionary proletarian ideology, to fight better against the bourgeois-revisionist ideology and, at the same time, have strengthened the hegemonic role of the working class. They are of great political and ideological importance, because they consolidate the dictatorship of the proletariat and make it invincible, ensure the unceasing march towards socialism. Our Party has always, but especially after the 4th Plenum of the CC in 1973, waged a stern struggle against liberalism in all the fields of life in order to uproot and sweep away all alien bourgeois and revisionist ideological influences. Liberalism, this favourite weapon of the bourgeoisie, imperialism and revisionism to destroy our socialist order from within, to confuse our people and bring about their degeneration, to befuddle their minds. Everything is utilized for this purpose – decadent literature and art, fashion, advertisement, extravagant tastes and behaviours. The ideologists and politicians of the present-day confused bourgeois-revisionist world claim that such ills as hooliganism, crime, prostitution and drug addiction, alcoholism and religious opium are inevitable phenomena of modern society. Our Albania provides the most convincing proof that these grave ills which ruin the life of millions of people are not unavoidable ills of any society in general, but only of the modern capitalist and revisionist society, because the doors may quite well be shut to them and they may be combated with complete success. But at the same time, we know that we are not immunized from every influence of the capitalist world, because there still are alien manifestations in our families, work centres and schools, in our literature and arts, in the attitude of our people towards labour and common property, etc. It is precisely for this that the Party teaches us to keep always sharp the sword against any bourgeois and revisionist influence which tries to penetrate into our sound revolutionary atmosphere. Part of the ideological and cultural revolution and a clear expression of its successes is the struggle waged against all traditions and customs, centuries-old canons, for the cultivation of the new norms of the socialist way of living, for their triumph everywhere – in the life of every family and every working man. In their traditions and customs, our people have inherited a wealth of good and beautiful things which have been formed in the course of their struggle for justice, freedom, dignity and national independence. But under the influence of private property, backwardness and fanaticism, supported by the foreign occupier and consecrated by religion, savage inhuman rules which trampled underfoot the personality of people, especially of women and youth, were implanted in these traditions. Under the leadership of the Party the working masses directed their main blows at the mouldy part of the centuries-old heritage. All backward concepts and customs, all conservative and patriarchal practices were attacked on a broad front. An unprecedented rigorous struggle with national and international ramifications was waged and is being waged both in breadth and depth especially against religion and for the complete emancipation of the women. It is the first time in world history that religion suffers such a great defeat; religious institutions do not function any longer in Albania; the prohibition of religious activity and the propaganda of religious ideology, this opium which is an inevitable offspring of the order of oppression and exploitation is sanctioned in the Constitution and applied in practice, The bourgeoisie and the revisionists spread religion in their countries and use it as a means to keep the working masses under yoke because religion carries out a reactionary ideological function. Our Party waged a successful struggle against the religious ideology because it mobilized the masses for this purpose. In the past history of our people religion was a tool in the hands of the foreign occupiers, a means to divide and split the people, an instrument to leave the people in darkness and ignorance. The Party and its levers carried out a militant atheistic propaganda, exposing the danger posed and the harm brought by religion systematically, with patience and wisdom. With the creation of new relations which make exploitation impossible and with all the ideo-educational work of the Party and state, conditions are prepared for a profoundly revolutionary situation in which people of their free will come to the natural and logical conclusion – demand the closing down of religious institutions and the prohibition of the activity of the clergy. This action for the liberation of people from the religious opium did not deprive the workers of any of their rights, as the bourgeois and revisionist ideologists claim, but represented an important step towards their emancipation, their liberation from the ideological poison of religion, from all the backward customs and traditions which benumbed the creative energies of the people, which trampled underfoot the dignity of the working man. But, despite the death blows religion has been dealt, we are realistic and entertain no illusions about religious beliefs and prejudices being liquidated once and for all from the consciousness of all people. We know that its remnants are still existent. They might revive and become active, if we lower our vigilance and the class struggle against them, because they are nourished by the old world and the bourgeois- revisionist encirclement. This is why the atheistic education of the working people remains an ever actual task of our education and cultural activity. A real unprecedented revolution both compared with our past and the present situation in other countries, has taken place in the life of the Albanian woman, in the position she occupies in society and the development of her personality. The degree of the woman’s participation in the revolution and socialist construction, in productive labour and political social life, in cultural activities and in training for the defence of the socialist Homeland has no example in other countries. And this occurs in a country where only some decades ago the woman was oppressed, was a real slave shut up within the four walls of her house. The all-round emancipation of the Albanian woman is the direct result of the general line of the Party, of the social economic, political and ideological transformations carried out and of the heroic struggle waged by the women themselves, with the support of all our people. As in all other cases, when the question was about the liberation of the working people and the abolishment of injustices and social privileges, in this case, too, the Party made no concession and carried things and processes through to the end. But we always bear in mind that the complete emancipation of the woman is a process which has to be deepened further. Leftovers of conservative customs and traditions still make themselves felt. First of all, their uprooting is linked with the development of an irreconcilable ideological struggle against them so as to carry forward the cause of the complete emancipation of the Albanian woman. The powerful movements, “Let us think, work and fight as revolutionaries”, “All for one and one for all”, “Let us break through the imperialist-revisionist blockade and encirclement”, etc., are expressions of a high level of consciousness; in these slogans stand out the mass heroism, the steel-like unity and determination of our people to build and defend socialism relying entirely on their own forces. In the struggle for revolutionizing the consciousness of the working peoples for the uninterrupted deepening of the ideological and cultural revolution, our Party has accumulated a rich experience also from the viewpoint of the methods of its development. It has carried out this struggle through systematic educational work, powerful mass actions, through debate and confrontation, public discussions and broad meetings, through wall-posters and the press, implementing the method of persuasion and the line of the masses, applying in practice the Marxist-Leninist principle that the masses are not only the object of the ideological and cultural revolution, but also the subject of it. The whole struggle for the communist education of the new man proves once again the Marxist-Leninist theses that of decisive importance in this work are not only the new socio-economic conditions, but also the role of the subjective factor, the organizing, mobilizing and transforming role of the revolutionary ideas. This struggle proves the theses of Marx that theory is transformed into a great material force when it wins over the masses. In the present turbulent world situation, full of grave contradictions and insoluble crises, two ideologies and two cultures are standing face to face in irreconcilable struggle: the proletarian culture and ideology, based on the Marxist-Leninist science, which heralds and prepares the dawn of the new socialist and communist world, and the bourgeois and revisionist anti-scientific and inhuman ideology and culture which defends the old capitalist world, the order which history has condemned to disappear and leave its place to a higher order, the socialist order. Defence and creative development of the triumphant science of the proletariat, the science of Marx, Engels, Lenin and Stalin, and closely linked with it, criticism and exposure of the bourgeois-revisionist reactionary ideology and culture in all the forms they manifest themselves, remain most urgent and important tasks not only for the Marxist-Leninist parties and the revolutionary world communist movement, but also for all the people of genuine progressive science and culture. In the struggle for the realization of this task facing present-day culture and science, the contribution of our Party, the theoretical work of Comrade Enver Hoxha stand out for their major importance. The Marxist-Leninist ideas of Comrade Enver Hoxha are a source of inspiration and education to carry the ideological and cultural revolution always forward; they are the most powerful weapon in the struggle for the triumph of the lofty ideals of socialism and communism. 1 K. Marx, “The German Ideology”, p. 114 (Alb. ed.). 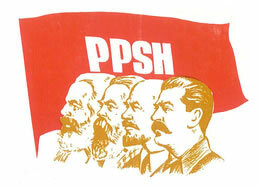 2 E. Hoxha, Report to the 5th Congress of the PLA (Alb. ed.). 3 Enver Hoxha, “Reports and speeches, 1972-1973”, p. 429 (Alb. ed.). 4 J. Stalin, Works, vol. 2, p. 348 (Alb. ed.). 5 E. Hoxha, Reflections on China, vol. 1, p. 230 (Engl. ed. ).